Proprietors Peter and Rebecca Work farm their estate vineyards in the Sta. Rita Hills AVA biodynamically. Their son, Don Schroeder, has been their consulting enologist until 2008 when he left to become winemaker at Sea Smoke. Bruno D'Alfonso (Sanford, Badge, Alma Rosa) has signed on as the consulting enologist. Danish national Peter Work developed an interest in America while working as a graduate student at Princeton. He took a job at Price Waterhouse as an information technology consultant. After marrying Rebecca (a former Alaska resident), the two dreamed of owning a vineyard. They cashed out of the human resources company they helped start, and in 1999 purchased an 82-acre property in the Sta. Rita Hills AVA that was former cattle-grazing land. Their first commercial wines were made in 2003 and they moved to their current winemaking facility in 2005 (originally shared with Ken Brown who later moved to the Terravant custom-crush facility in Buellton). They have developed a 25-acre estate vineyard planted to Pinot Noir and Syrah. The vineyard is the first in Santa Barbara County and one of the few in the country to be certified sustainable, organic and biodynamic. 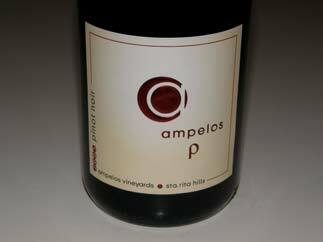 In 2000, the Ampelos Cellars label was born and the first estate wines were released from the 2002 vintage. Ampelos is a Greek word meaning "vine." The Works spend time each year in the Mediterranean and there they maintain a guest house on Folegandros in Greece's Cycladic Island group. In addition to Ampelos Cellars estate Pinot Noir and Syrah, Syrah, Grenache and Viognier are produced from purchased grapes. Estate grapes are supplied to Brewer-Clifton, Jaffurs and Samsara for their own vineyard-designate Ampelos bottlings. Total production is 3,500 cases annually.